Ever wonder what a master development plan looks like? 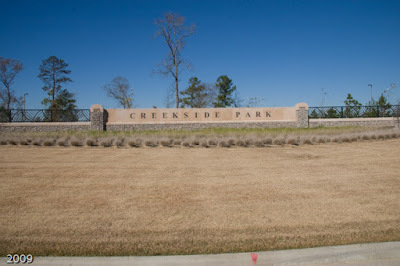 A summary for the Village of Creekside Park in The Woodlands, Texas, is presented in a brochure, an abbreviated version of the plan at the developer's website. It is an overview which gives the public a marketing vision of the total layout. It includes various single-dwelling residential "areas" where the frontage size of lots are predetermined. Each "area" is designated for such entities as multi-family homes, apartments, commercial and retail stores, schools, churches, parks, bodies of water, golf course, or open space. Bounded by George Mitchell Preserve on the northern, eastern and western perimeters, the village is shaped like a "U", nestled in a bend of Spring Creek. 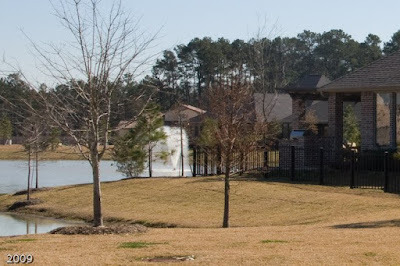 Fazio Golf course with Carlton Woods Creekside homes fits into the eastern bottom of the "U" (north), accompanied by multi-family dwellings on the western side of Kuykendahl. 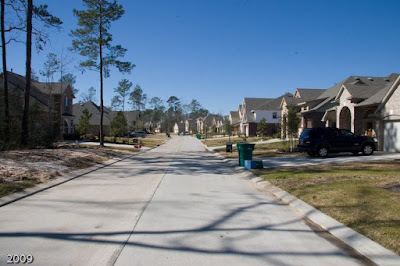 The plan consists of 4769 single-family residences, 529 age-qualified (over age 55) homes, 1494 multi-family homes, and 308 homes in the gated community of Carlton Woods Creekside. Homes range in cost from $200k to $3+ million. 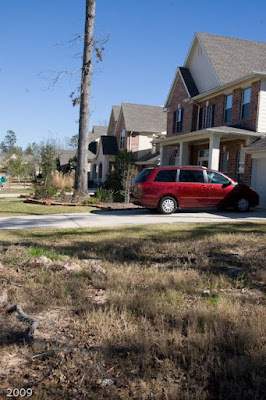 The concept is to have a mixture of home styles and builders, similar to the other eight villages of The Woodlands. The village will be home to some 7100 families when built out. (3) locations for schools (two K-5 elementary and one 6-6 middle school). (15) park or recreation sites, excluding George Mitchell preserve. There will be a meandering linear park through the center of the village which is not evident on the map of the plan. Also included is a 12-foot wide hike-and-bike trail along the lake. Featured is an aquatic park, a YMCA for family recreation and a special nature-themed village park. These make this potentially the best of all villages with respect to nature. (17) bodies of water (1 lake, the remainder characterized as ponds). Lake Paloma is situated on about 72 acres. (6) large 80-ft lot areas, all on or near Lake Paloma, in the southeast part of the village. There will be many homes offered on the lake which is shaped to provide a long shore frontage. (11) 70-75-ft lots areas, split between the Lake Paloma area and the western area adjoining George Mitchell Preserve. One of these will offer homes right on Lake Paloma. 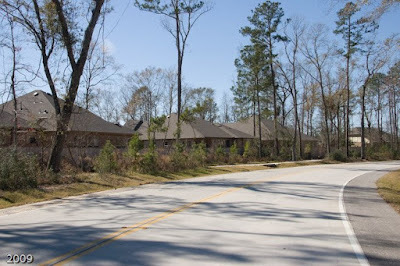 (01) large 500 acre area for Carlton Woods homes, mingled in and around the golf course. 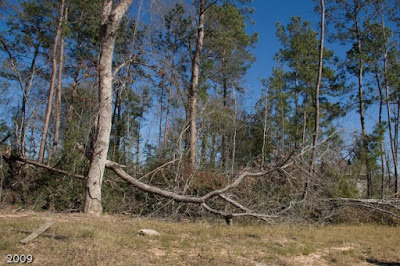 The area on which the development is in progress, has been part of the east Texas forest, full of Pine, Oaks and various other tree species. Deer have roamed here for decades, being protected by the thick Yaupon brush and other smaller trees. The Bald Eagle has nested in its trees; the Red Wing Hawk has flown its skies. There has been plenty of Racoon, Possum, Tree Rats, and Coyote living in this forest.